/a:t/BrE is how Britons pronounce art. It is the name of our performance art group when pronounced correctly. Other pronunciations are the names of other groups. We do not consider our perfromances ‘art’ in the proper sense. They are rather art in its improper sense of the word, hence the title /a:t/BrE. Each member of the group is called a cutartist, for, we build our performance spaces by cutting and sticking together cardboards. Anybody pronouncing it fast will experience some kind of Aristotlian catharsis. Our performances can be gallery-free, i.e. performed anywhere and even commissioned and tailored to a single audience. We sometimes build our portable galleries out of cardboard which we call performance box. Everything we build is a structurl–a churlish structure. Interactive objects made out of cardboard made for the enjoyment of a guest in a party. Most partying tools facilitate communication and interaction between two guests. 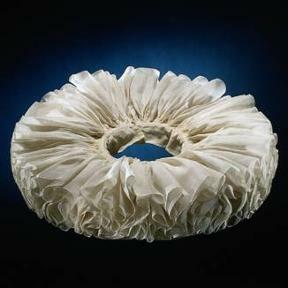 The millstone ruff is a round collar made of pleated white linen. It was fashionable in Holland from the late 16th century to about 1625. They began small, but became increasing broad until finally resembling millstones. We wear paper ruffs due to its resemblance enlarged section of a cardboard. Since we were gradually making money out of this non-commercial art known as performance, we thought of registering the first Iranian performance art company with limited responsibility. We chose a rather cheesy name for it, meaning ‘those who promote contemporary performance’. Company names in Iran need to be combined of three words and hence the combination, ‘Ejra Gostaran Moaser’.